Most households use an immersion heater to heat hot water, so it makes perfect sense to adopt PV solar technology that can provide hot water too. Compatible system sizes: 0.5 - 4KWp. This reason is why I am now excited about a product which can turn your photovoltaic system into a hot water generator, by just using some of your excess solar-generated electricity to keep your hot water tank with a plentiful supply of hot water. 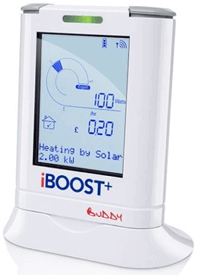 Yes, an optional temperature sensor can be fitted to the PV to hot water converter to display the water temperature.